A luxurious collection of shaving products in precious fragrance: N° 908 Homme. A luxurious collection of shaving products in precious fragrance : Axolute Homme. A fascinating collection of shaving products and for the cure of a beard and mustache. A luxurious collection of shaving products in precious fragrance : Florence. A luxurious collection of shaving products in precious fragrance : Nobilis. Shaving brushes in pure Badger with an elegant plastic handle made of fine finishes of different color. Shaving brushes in pure Badger made with precious resin handles, fine wood and metal, completely handmade. Precious shaving cream in luxury wooden Bowl. Available in six Classic fragrances. Traditional solid texture. Use with brush. Precious shaving cream in luxury plastic bowl with frosted background. Available in six Classic fragrances. Traditional solid texture. Use with brush. Precious soft shaving cream tube. Available in four classic fragrances. Use with brush. Precious shaving Soap, in solid texture. Available in six Classic fragrances. Use with brush. Precious shaving cream in comfortable “ Travel pack” , to take it everywhere with you . Available in six Classic fragrances. Use with brush. Precious shaving cream refill for luxury wooden Bowl. Available in six Classic fragrances. Fine hand-crafted razors with precious resin handles, metal and wood available with Mach 3 or Fusion original blade or in Classic version with Safety blade. Comfortable razor in plastic handle, with original Mach 3 blade. 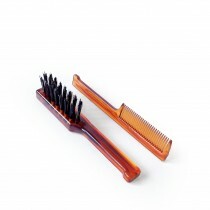 Precious holders to place the shaving brush and the razor after the use. For a correct storage of the brush. 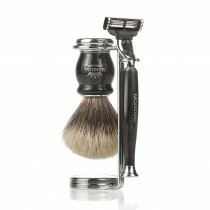 Gift pack Exclusive, available in Standard Line : with shaving brush only and also in Premium Line : with brush and razor. Gift pack Basic, available in Standard Line: with shaving brush only and also in Premium Line : with brush and razor. Professional Make up brush of high quality. Natural hairs. Made in Italy 100 %. Super Professional Make Up brush "Top quality ". We use only the finest natural hairs of I° quality. Made in Italy 100 %. Ideal for beauty salons and professional makeup schools.